A blue-black giant of a woman wearing a tigerskin loincloth, standing 50 feet tall with flaming orange hair, standing in a torrent of flames and holding a skullcup filled with blood. That was the sort of person we needed at the moment. Overcoming the monsoon requires almost unimaginable power. 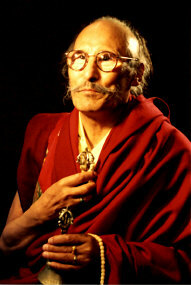 Before me, though, stands Yeshé Dorjé Rinpoché; a gentle, bespectacled Tibetan Lama. He also happens to be the primary weather-controller for His Holiness, the Fourteenth Dalai Lama of Tibet. Glancing at the Rinpoché, it is hard to imagine that he can indeed marshal the necessary resources. This area has the second-largest annual rainfall in all of India. Yet he has a personal interest in altering today's weather. Construction at his monastery is to continue today, and the weather has to clear. But the weather is not obeying. It's still raining. Actually, it's pouring. Rinpoché is soaked, and so am I. Quite sure we are the only human beings standing outside at 6:30 a.m. in the rain, we are perched atop Zilnon Kagyeling Monastery in McLeod Gang, roughly a mile up the hill from the palace of His Holiness, the Fourteenth Dalai Lama. In a few days it will be His Holiness's birthday, and he has requested that Lama Yeshé Dorjé ensure dry weather for the occasion. At 5:30 a.m., I left a warm bed to climb up a muddy trail in the heaviest rain I have felt in my life, curious to see an indication of the Lama's capability. It's looking bad for the Rinpoché. He seems unconcerned. Grinning at me through the downpour, he places a trumpet to his lips. No ordinary instrument, this, it is fashioned from a human thighbone. Used in practices to control the most powerful forces of nature, this kang-ling is covered in silver and leather. Rinpoché blows a long, plaintive note, followed by three shorter bursts. There is an enormous crack of thunder, and it seems to pour even harder. My fancy Gore-Tex raincoat is no more comfortable than a wet towel. Even Rinpoché seems chastened. We wait. He sounds another series, which echoes into the mists and down to the valley floor. However abstract the role of a weather controller may seem to us in the West, it is a vital function for an agrarian society. In the high mountain fields of Tibet, the short growing season makes drought a constant concern. Damaging hailstorms or ill-timed rain, as well as too much rainfall, can also easily destroy an entire crop. Without the services of a capable weather-controller, entire villages may starve. Interspersed with cracks of thunder, the downpour continues. Rinpoché shrugs and walks down to his residence to change his soaked raincoat. I seek refuge in the temple. Surrounded by fiercely-visaged statues and paintings of wrathful Tibetan meditational deities, I watch the rain gushing off the roof. The construction will have to be delayed. This is a serious setback for the Lama, as today, Sunday, is the best day for such a project. In this area of McLeod Ganj, concrete is not moved by machine, but is carried up by physically passing bowls of wet concrete from man-to-man. A large project like this requires a lot of volunteer help, most of whom can only come on a Sunday. Twenty minutes later, the rain is just as heavy. Rinpoché returns and I dutifully join him. Again, the thighbone trumpet is brought out and blown. Smoke drifts into our faces from the juniper wood fire that is smoldering down below. Periodically, a special incense is thrown on the fire at the Lama's direction, and its sweet pungency adds to the aroma of the juniper. A figure appears through the mists. It is Tra-joong, one of the monks in three year retreat at the monastery. He brings an umbrella for Rinpoché, and I huddle with him under its slight protection. A final series of notes and a series of mantras are whispered, and the Lama again smiles at me, blowing through pursed lips as he extends his right arm in a circle around himself. I understand that he's pantomiming pushing the clouds away. As he invites me down to breakfast, I note that the rain is finding its way right through the fabric of the umbrella. I feel a pang of sadness for the Lama. I would've wished him success this morning. He seems confident, however, and his appetite demonstrates that he is unconcerned. In my honor, his son, Karma Sonam, has prepared French toast. Carefully avoiding the subject of rain, I learn that the source of the Lama's power resides in his meditational practice, which originated in Tibet during the eighth century. 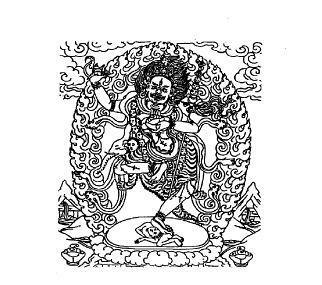 Then, the tantric master Padmasambhava was credited with bringing Buddhism to that country and starting a lineage of practice known as the Nying-ma. Known as Guru Rinpoché to the Tibetans, a large gilded image of the Master graces a central position at Zilnon Kagyeling. Lama Yeshé Dorjé is not only a Nying-ma Lama, but he is also a Ngak-pa: one of a small group of yogis who specialize in unusually difficult and dangerous practices, requiring control of vast powers. One example is controlling the weather; another is the Dür ceremony. Here, the Lama is required to summon all of the negative forces afflicting the people who come to the ritual, and appease and disperse them. The participants are thus relieved of the obstructing forces in their lives, whether physical or mental. So dangerous is this ritual that this Lama is one of the very few to perform this ceremony. Nonetheless, the Lama tells me later, it is much more difficult to control one's mind than to control the weather. He seems to be gently suggesting that the former is a more appropriate project for me than the latter. We finish breakfast. It is still raining as the workmen appear and stand around helplessly. Rinpoché takes a nap. By 10 a.m. the rain begins to slow, and it is only a light drizzle by 10:15. This is ideal, as the concrete will crack if it dries too quickly. I leave the monastery to visit the Library of Tibetan Works and Archives as Rinpoché begins to supervise the work from the roof of the monastery. When I return at about 2 p.m., volunteers have arrived and are already passing concrete. I join them, struggling to keep up with René, a seemingly inexhaustible young girl who has become a student of the Rinpoché. By 6:30 the work is done. Clearly, the weather has been subjugated, after all. Four days later, it is July 6th. His Holiness's birthday is celebrated by Tibetans through prayer ceremonies, feasting and singing. There is a slight drizzle at 6:30 am as I arrive at the monastery. Lama confirms that he has already performed the ritual to ensure good weather, and that I should wait to see the result. True to prediction, it becomes a beautiful morning, and is clear and sunny almost all day. The entire monastery is planning to have an outdoor feast for dinner, and I am invited. In the courtyard, Karma Sonam is overseeing a feast of meat, pancakes and potatoes, and we are joined by a visiting Lama and a Buddhist nun. Every dish is simple and delicious. Clouds begin to roll in, but the Lama gives no hint of anxiety. Suddenly, a rainbow arcs over the monastery and the monks exclaim their delight. Rainbows are a special sign of Guru Rinpoché. I look to Lama Yeshé Dorjé for his reactions, and am rewarded with a wink and a broad smile. The monsoon continues the next day as usual.